Adults and kids alike will love these Sausage Mushroom Pizza-Dillas (a.k.a. 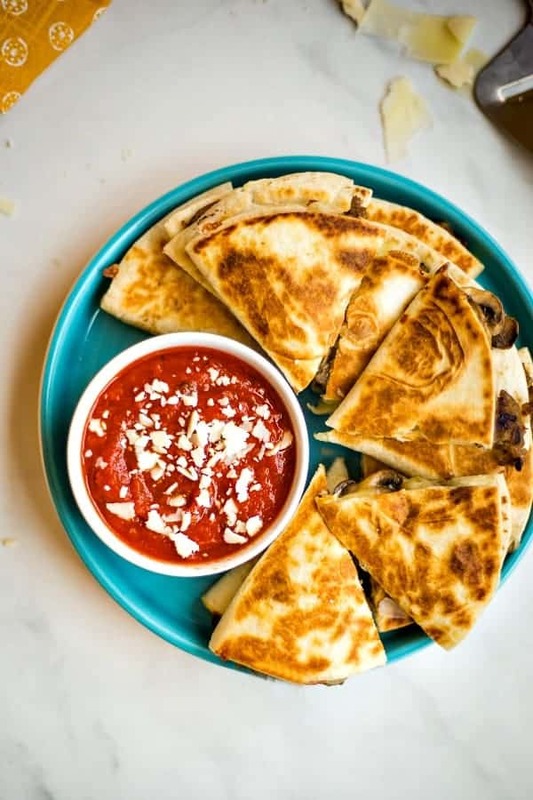 pizza quesadilla) served with a warm marinara dipping sauce. This easy recipe is a great weeknight dinner option as well as a fun party appetizer that your guests will love. 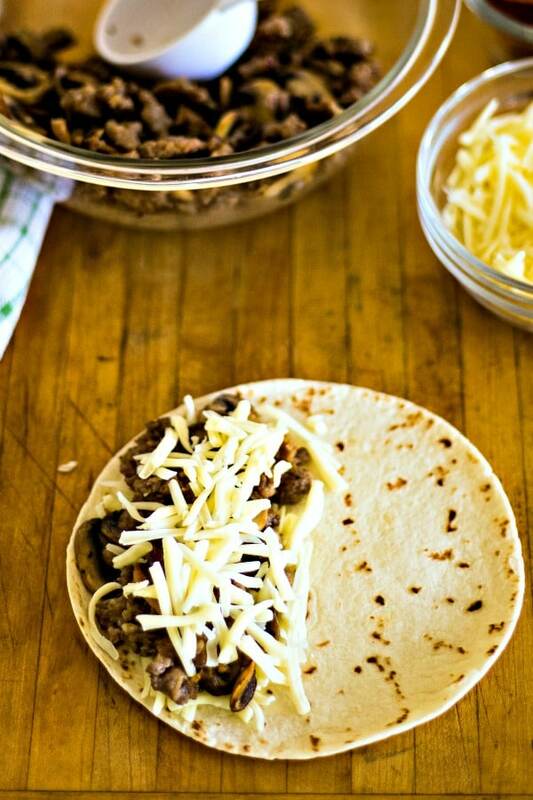 Stuff flour tortillas with a mixture of Italian sausage, mushrooms, and mozzarella cheese and pan fry until golden brown. Cut each pizza-dilla into triangles and serve with a bowl of heated-up jarred marinara sauce. Customize this recipe with your favorite pizza toppings like pepperoni, peppers, onions, or even ground beef. 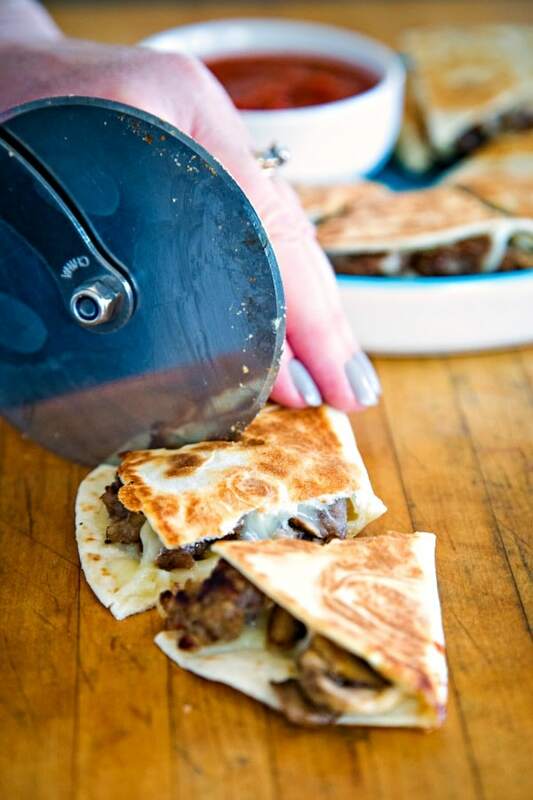 Your family will love this Italian spin on traditional Mexican quesadillas! When our girls were growing up, on any given Sunday our family was running from morning church to afternoon visits with grandparents to Sunday evening choir rehearsals which meant our lazy Sundays weren’t so lazy! Don’t get me wrong, we loved those busy days! But, busy Sundays called for an easy Sunday night dinner. We’d often grab a pizza or make a quick sandwich, or grill cheese quesadillas topped with whatever leftovers were in the fridge. 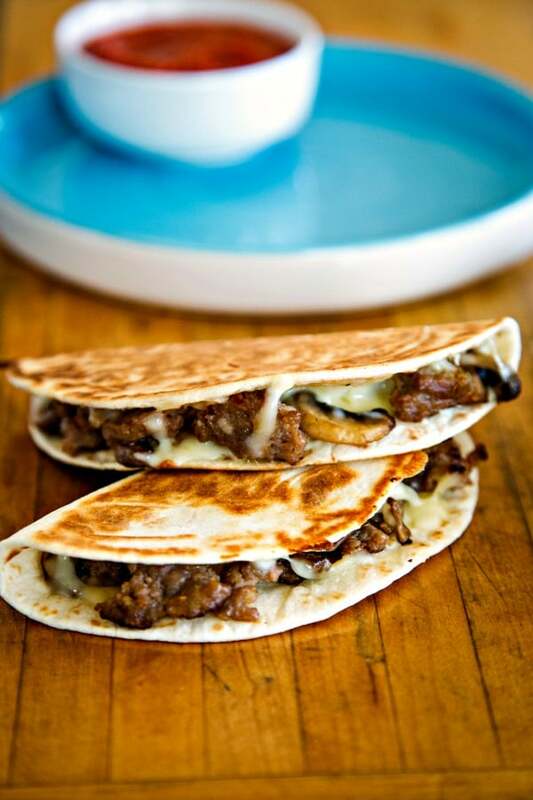 Today’s Sausage Mushroom Pizza-Dillas are a fun twist on traditional Mexican quesadillas. 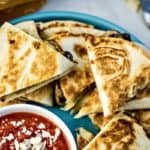 Make the Italian sausage and mushroom filling ahead of time and store it in the fridge and then make as many or as few quesadillas as you like at a time. Use your favorite marinara sauce for dipping and you’ve got a fun dinner for everyone! What other topping can you use for pizza-dillas? Start by cooking the Italian sausage until it is no longer pink, breaking it up into crumbles. Remove from the skilled and drain on paper towels. Wipe the skillet clean, then add a tablespoon of olive oil and the sliced mushrooms. 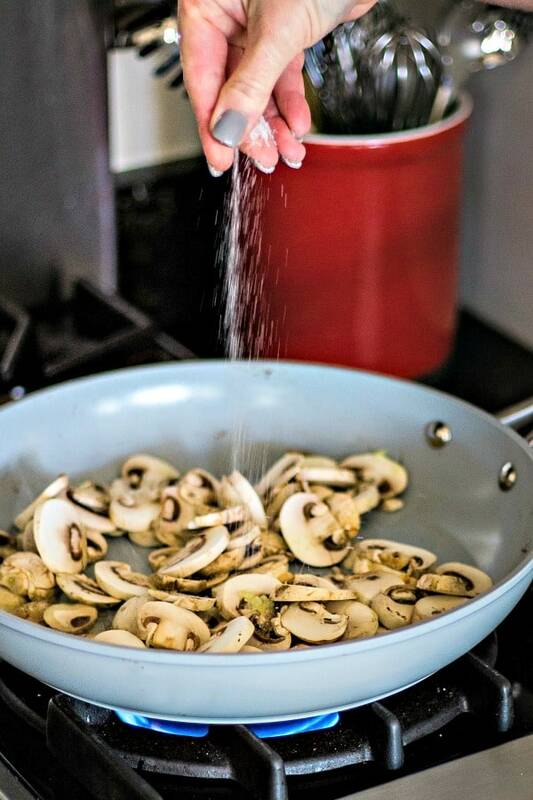 Season with salt and sauté for about five minutes or until the mushrooms are tender and no liquid remains. Combine the cooked sausage with the mushrooms in a large bowl. At this point, you can cover and store the pizza-dilla filling for use later or start to assemble the pizza-dillas to cook immediately. Lightly coat one side of the tortilla with cooking spray. Flip it over and layer a couple tablespoons of mozzarella cheese, the sausage-mushroom filling and more cheese on one half. Fold the tortilla over the filling and carefully place into a nonstick skillet over medium high heat. Cook on each side for one to two minutes, or until golden brown. In the meantime, heat a cup of marinara sauce in the microwave. If desired, sprinkle the warmed sauce with Parmesan cheese. Cut each pizza-dilla into thirds and serve with the dipping sauce. Simple, easy, tasty, and fun to eat! 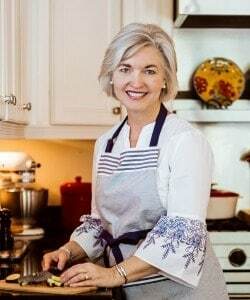 My new Bialetti Titanium Infused Ceramic Nonstick 12-inch skillet and I’d love to gift one to one lucky reader! Bialetti’s Silver TI cookware features a titanium-infused ceramic nonstick interior for superior release and durability and a riveted stainless steel handle. Made without PTFE & PFOA, it’s oven safe up to 400F. The heavy gauge aluminum construction allows for superior heat distribution. Silver TI’s interior and exterior are easy to clean. Available now exclusively at Bed, Bath and Beyond in an 8-inch sauté pan for $19.99, 10-inch sauté pan for $29.99 and 12-inch sauté pan for $39.99. 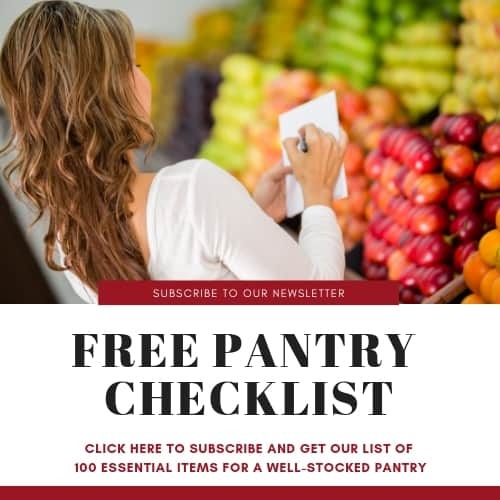 The lucky winner will be randomly selected from my email subscriber list on Friday, April 12, 2019, so be sure you’re on the list! Did you make this Sausage Mushroom Pizza-Dillas recipe? 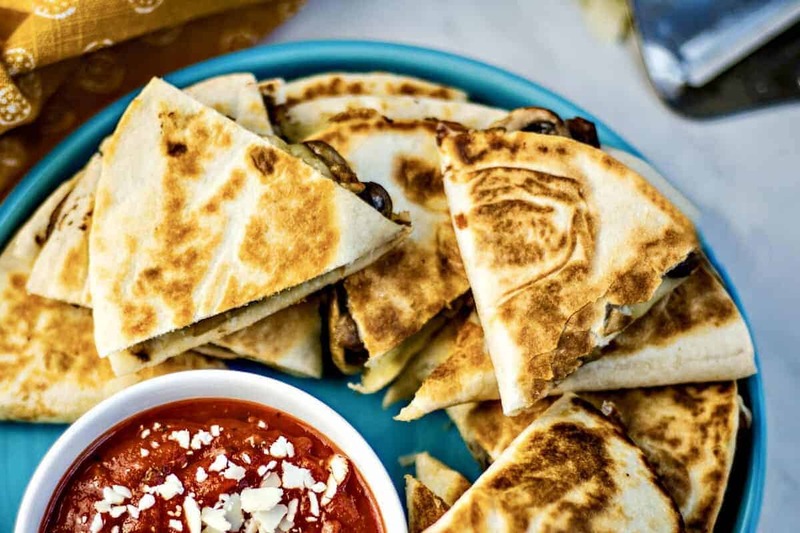 Adults and kids alike will love these Sausage Mushroom Pizza-Dillas (a.k.a. pizza quesadilla) served with a warm marinara dipping sauce. This easy recipe is a great weeknight dinner option as well as a fun party appetizer that your guests will love. Cook Italian sausage in a nonstick skillet over medium high heat until no longer pink, about 5-7 minutes. Remove to a paper towel lined plate to drain. Wipe out the skillet. Reduce heat to medium and add 1 tablespoon butter, sliced mushrooms, and salt. Cook and stir until the mushrooms are tender and no liquid remains, about 5 minutes. Place mushrooms and sausage in a bowl and stir to combine. Spray each tortilla with cooking spray on one side. Flip the tortilla over and one one half layer about 2 tablespoons of cheese, 1/4 cup of the sausage mixture, and another 2 tablespoons of cheese. Fold the tortilla in half over the mixture. Place two pizza-dillas in the pan and cook on each side for 1-2 minutes or until nicely browned. Repeat with remaining pizza-dillas. Using a pizza cutter, cut each piece into thirds. Serve with warmed marina sauce (garnished with Parmesan cheese, it desired).